Aquaguard Pool Fences offers numerous features that make our swimming pool fencing the best choice in the industry. Options such as angled raised panels, stairs, self-closing gates and many others make our swimming pool fencing completely customizable. Angled Raised Panels: Many of our customers have backyards that include changes in the elevation of the deck area. These elevation changes can come in the form of regular steps, retaining walls, raised planters, and other structures of various heights.The problem with an elevation change is that a small child may be able to climb up onto a higher elevation and climb over the pool fence that is located on the lower elevation. In addition, a removable swimming pool fence does not look very good when there is a rough transition from a lower elevation to a higher elevation. Aquaguard’s unique angled raised panels help address these challenges. They provide the extra safety measures and an aesthetically appealing transition for these special situations. 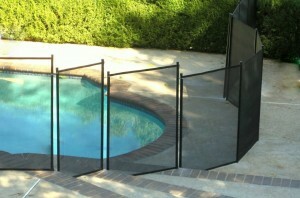 Self-Closing Gates: Aquaguard Pool Fences offer a completely removable, self-closing, self-locking pool gate. Our gates use the industry leading Magna Latch and Tru-Clos hinges to protect your children from entering the pool area without an adult. Our Aquaguard pool gates are approved by the ASTM and satisfy the local and state codes in your area. 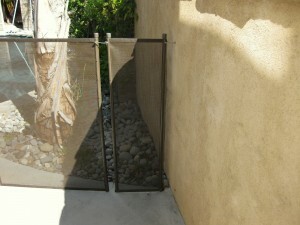 Each pool fencing gate also comes with a key-locking option for added security. Stairs and Curved Edges: Aquaguard listens to our customers before each installation to make sure that your pool fence is installed exact the way you want it. We can follow the contour of your pool with curved edges or shoot straight across to a house or wall. Stairs are one of the more difficult parts of a pool fence to install. Aquaguard makes sure that each of our installers is properly trained on how to do these. A poorly installed fence that goes up stairs will have poles that are not aligned properly creating a messy look and will have waves in the mesh. 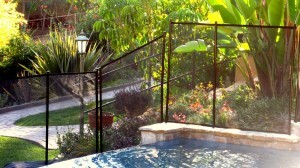 Aquaguard makes sure that this section is installed with the same level of quality as the rest of your pool fence. Custom Endings: While we recommend having your pool fence go completely around your swimming pool to create a full enclosure, we understand that sometimes this is not possible or desired. We can customize your fencing design to end at a wall or other surface. This can provide a more economical approach when less footage is used while still offering a safe pool barrier for your family. 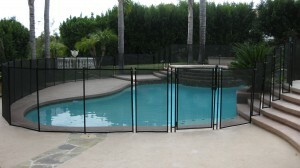 Contact us for more information on how we can customize a pool fence for your pool area.